There are many factors to consider when choosing a podiatrist or any other type of doctor. Here are a few important questions to ask. Is your doctor board certified? Podiatry is a surgical profession. If a patient has an abscess or infection in the foot and ankle, a fracture, or a painful deformity of the foot and ankle, your podiatrist may decide to address the pathology surgically. Rather than waiting and looking for someone else, a podiatrist who is board certified in foot and ankle surgery can take care of you. This will not waste valuable time. The American Board of Foot and Ankle Surgery is the premier certifying board for foot and ankle surgery, recognized by the American Podiatric Medical Association as having the highest standards for foot and ankle surgery. Dr. Strash is double board certified. He is board certified in Foot Surgery and Reconstructive Rearfoot/Ankle Surgery. 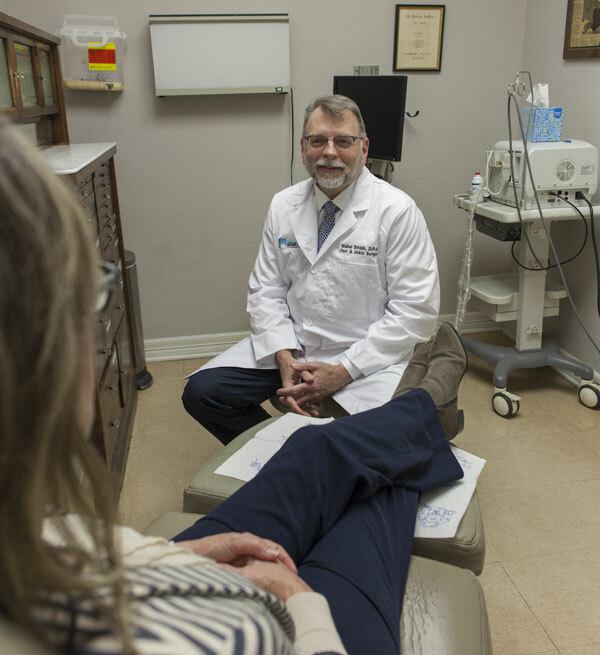 As a podiatrist who is board certified in both foot surgery and ankle surgery, Dr. Strash has the training and experience to treat all of your foot and ankle problems. Does your foot and ankle surgeon have special interests? It’s important to know if your physician has a special interest in certain pathologies. An increased interest in various pathologies may mean your specialist is better able to treat this condition. Dr. Strash is a board certified podiatrist who has a passion for treating foot and ankle fractures, plantar fasciitis (heel pain), neuromas, ankle sprains, achilles tendonitis and bunions. He has published articles in various medical journals on these topics and finds treating patients with these problems mutually gratifying. Does your specialist have an academic appointment? Doctors who teach tend to keep up with the latest advancements in their specialty. Dr. Strash serves as an associate professor in the Department of Orthopedic Surgery at the University of Texas Health Science Center in San Antonio. He teaches the podiatry residents in the operating room and gives lectures. He has also mentored many students who are interested in a career in medicine. What do others say about your doctor? Have a look online to see what other patients are saying about the specialist you are about to visit. Many patients and referral sources have given excellent reviews about Dr. Strash and his practice online. Take a look.